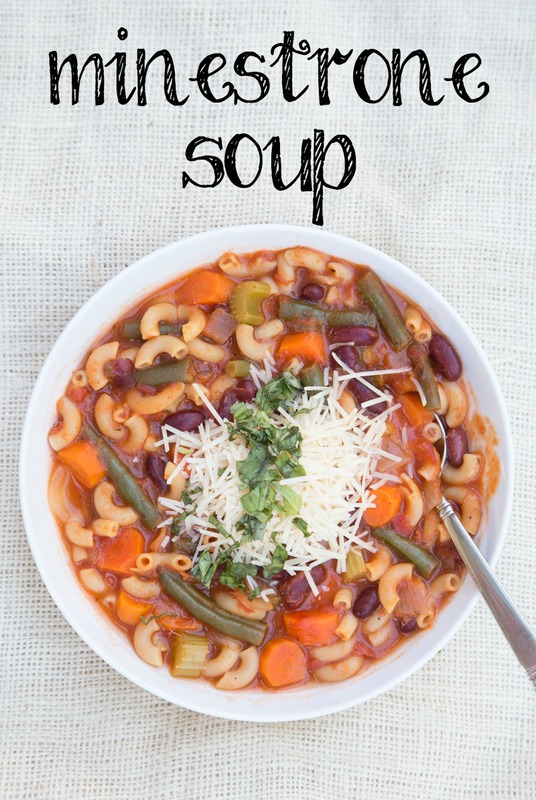 I adore a bowl of Minestrone soup. I adore pretty much any bowl of soup. And that’s why I’ve loved this month…sharing all these amazing soup recipes with you. 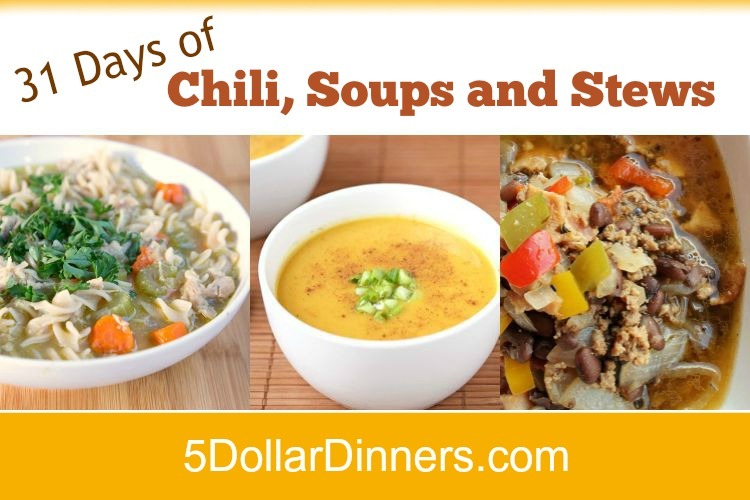 My taste buds and tummy are happy, and I hope yours will be too…as you try these new recipes! I like to make my Minestrone soup with butter as the fat base for sauteing the veggies. It some how adds just the teensiest hint of creaminess to the soup. You could certainly use olive oil, but try it with butter and see if you notice a difference! Also, I highly recommend the fresh basil garnish. Might not be worth spending $2 for a little packet of basil from the store…unless you plan to make a fresh basil pesto in the same week! (Then it’s totally worth buying the little pack of basil!) But if you have a basil plant on your porch or in your garden, go tear off a few leaves and chop-chop-chop to garnish this soup. In a large saucepan, melt the butter and saute the onion, celery, garlic and carrots for 4 to 5 minutes. Stir in the green beans, tomato sauce, kidney beans and stock. Bring to bubbling. Once bubbling, stir in the pasta noodles and cook for 8 to 10 minutes, or until al dente. Seaon with salt and pepper to taste. 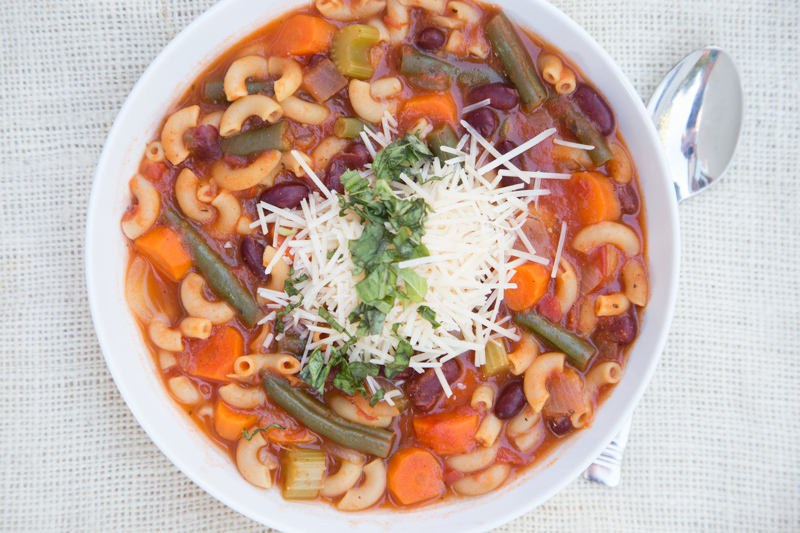 Serve Minestrone Soup with optional Parmesan cheese and chopped fresh basil. Delicious! One of my boyfriend’s favorite recipes. There was enough for both of us for two days. So yummy.